Lockhart Correctional Facility is a minimum security prison located in Caldwell County. 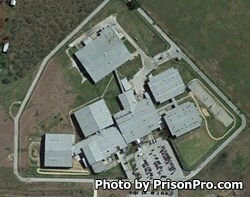 It serves as a Prison Industry Enhancement (PIE) program, and is also known as the Lockhart Work Program. Lockhart is a co-gender facility that houses up to 500 males, and 500 females. As a designated PIE facility, Lockhart provides many work opportunities, educational and vocational programs to offenders. In return, offenders who participate in the Lockhart Work Program agree to pay a percentage of the wages they earn towards room, board, supervision costs, court fee's and restitution. Inmates at Lockhart have access to adult basic education, life skills courses, and can earn a GED while incarcerated. Vocational training is provided in computer operating systems, and computer information systems. Inmates can earn a wage manufacturing air conditioner parts, heating valves, computer boards, and wiring harnesses for Henderson Controls Inc. and OnShore Resources. Additional programs at Lockhart Correctional Facility provide offenders with parenting training, victim awareness, and substance abuse education. This facility also participates in the PAWS program which allows inmates to work rehabilitating and training shelter dogs. Lockhart Correctional Facility conducts visitation on Saturdays and Sundays from 8am to 5pm. Visits are two hours in duration. An inmate may have one visit per weekend with up to two visitors (children under 16 do not count, number of children may be limited if the visiting room is crowded). Visitors may bring up to twenty dollars in a clear plastic Ziploc in quarters to purchase food from the vending machines. This facility may not allowed visits during a lockdown, you should always call prior to attending a visitation session to ensure the visit has not been canceled.